In Part 1 of this series I introduced the Back to Eden gardening system, which is so popular that it really doesn’t need much of an introduction to most informed gardeners. And I wrote about the remarkable Paul Gautschi, who is such a compelling spokesman for Back to Eden gardening. My recommendation is that if you like the Back to Eden wood-chip-mulched gardening idea, then you should give it a try. The benefits of covering soil with a natural mulch, and never tilling the underlying soil are undeniable. But I also recommend that you try it on a small scale first. That is my recommendation with any new gardening concept. Dip your toe in the water before you jump in. I think it is important to point out that when it comes to gardening, one size doesn’t fit all. Which is to say, every garden and every gardener’s personal situation is different. Soil types vary. Growing climates vary. Land availability for gardening varies. The gardener’s capacity for physical work varies. His or her time for gardening varies. Financial resources for gardening vary. And the desired outcome will also vary. For example, some people want to feed a large family and put up lots of food, while others (like me) are more focused on growing so that only two people (my wife and I) can eat fresh from the garden every day, as long as possible, while preserving smaller amounts of food for out-of season eating. Furthermore, please remember that successful gardening is really more of a journey than it is a destination. No one ever finds total gardening success the first time they plant a garden. And even those who have gardened for decades have their share of yearly failures. One of the attributes of a successful gardener is that they are continually experimenting, continually evaluating, and continually refining their own particular approach to gardening. That said, around 15 years ago, I experimented with wood-chip mulch in my garden. I had the wood-chip mulch for maybe three years. My experience was that the wood chips reduced weeds, kept soil moist, and were an ideal environment for slugs to live, breed, and hide during the daytime. The slugs made nightly forays into my crops and inflicted considerable damage. It was very discouraging, to say the least. When I finally raked out the wood-chip mulch, slug damage dropped to tolerable levels. Some years later, when I tried mulching with black plastic, slug damage became almost non-existent. I once had the opportunity to personally ask Lee Reich, author of the book, Weedless Gardening, about slug damage in his wood-chip-mulched gardens. He told me that slugs were not a problem for him. I have listened to numerous YouTube videos with Paul Gautschi, and slugs are not mentioned. I don’t see slug damage on his plants. Eliot Coleman (who does not, as far as I know, use the Back to Eden approach to gardening) says in his books that ducks are the best solution for slugs in the garden. I had a couple of ducks once. They were a lot of fun to watch. Unfortunately, I didn’t have them when I had wood mulch in my garden. Besides that, some sort of wild critter ate both ducks. But I digress. So it is that I had what I consider to be a bad experience with wood-chip mulch in my garden. Nevertheless, I still think wood-chip mulch is a great idea (though not for my own vegetable garden) because, as I noted above, it is a soil cover ("armor" is the word often used) and it eliminates the soil disturbance common to traditional gardening. I am convinced more than ever that covering the soil and not-tilling are beneficial and desirable for ultimate soil and plant health in any home garden. Now, after watching more videos about Paul Gautschi and his wood-chip-mulched gardens (This Video in particular), I’ve come to realize that Paul’s primary use of wood-chips-only as a mulch is in his orchard, around various other trees and bushes, and in his herb garden. In his asparagus bed too. But he takes a somewhat different approach in his vegetable garden. I’ll discuss this different approach below. Before that, let me say that I’m totally persuaded that wood chips (ramial wood chips in particular) are a perfectly ideal mulch for trees and bushes, and herb gardens (slugs don’t like most herbs). This is, after all, a widely accepted understanding in the horticultural world. You have to listen carefully to the videos to pick out specifics, and sometimes the specifics change. Visitors will often ask questions of Paul and his answers are not always clear or to the point. —Paul has a very large area of land under wood chips. It takes an enormous amount of wood chips to cover that amount of ground, and a lot of work to spread it around. Then, it takes more truckloads of chips to continually add to the mulch as it decomposes.Wood-chips can decompose surprisingly fast. —A wood chip mulch does not smother out all weed growth. Paul has weeds in his garden. The mulch reduces the amount of weeds, and any weeds that grow are more easily removed (by pulling). —In Paul's book, Growing Food God's Way, ramial wood chips are recommended for mulching. Ramial chips are made from living wood (having leaves or needles) that is less than 3” in diameter. Shredded bark, sawdust, or wood chips from large, dead wood are not recommended. 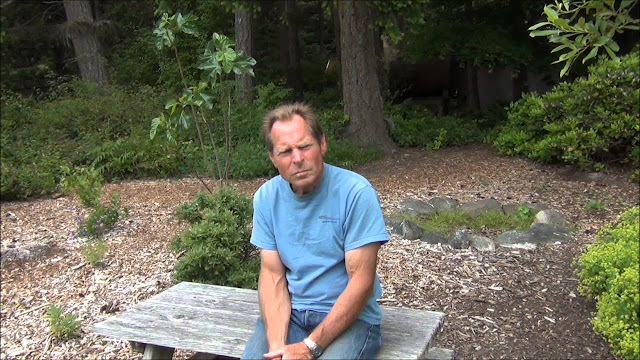 —Paul recommends that people use a 4” layer of wood chips to establish their garden. A layer of newspapers underneath is a good idea. However, if you are not using newspapers, and you are establishing a garden over sod, Paul recommends an 8” layer of wood chips. —Paul has a plot of land separate from his homestead where he established a wood-chip-mulched garden over well-established quack grass. He says a 12” layer of wood chips smothered the quack grass. —Quack grass rhizomes thrived in the wood-chip mulch I used in my garden years ago. They infiltrated and migrated throughout the garden like never before. But I don’t think I had more than a 4” depth of chips to start (and that level dropped a lot as the chips decomposed). —A 12” layer of wood chips is probably just fine for tree and shrub plantings, but it would be awkward with a vegetable garden. That’s because seeds and transplants are not planted in the wood chips, they are planted in the soil under the wood chips. The chips must be moved aside some when planting. —Paul’s 2016 vegetable garden was not covered with wood chips. It may have been covered with wood chips years ago (the Back to Eden film came out in 2011) but it doesn’t appear that any wood chips have been added since then. —Instead of wood chips, Paul’s vegetable garden is now covered with what I would describe as chicken-scratch-compost. It is a mixture of horse-manure-and-wood-shavings that he adds to his chicken house and lets the chickens scratch through for a few months. In addition to that, he throws all his garden and yard waste into the chicken yard for the chickens to eat, scratch through, mix up, and add their droppings to. The semi-composted accumulation is then sifted through 1/2” hardware cloth and spread over the garden. Paul has around 30 chickens. —I’m very familiar with chicken-scratch-compost. Years back, when I grew a LOT of garlic on my neighbor’s land, I used a handful of my own, sifted chicken-scratch-compost in each garlic bulb planting spot. I grew gorgeous garlic. Every bulb I pulled up at harvest time had at least one earthworm in the soil round the roots. Chicken-scratch-compost is good fertilizer. 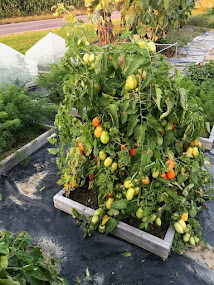 —Paul is wary of using manures and other organic mulches because of the herbicides and other chemicals they may contain. He says those concerns do not apply to wood chips. —Wood-chip mulch is never tilled into the ground. If the chips stay on top of the ground, they promote biological activity and health in the underlying soil, and they do not rob the soil of nitrogen that your garden plantings need. —Paul says that if someone wants to add additional fertilizer to their wood-chip-mulched garden, they can spread blood meal on the ground before the wood chips. He has also spread ashes from his wood stove over the wood chip mulch. —Paul asserts that when it rains, the water flowing through the mulch covering creates a “compost tea” that flows down into the soil. Thus, there is no need for ever making something like compost tea as a separate amendment. —In an interview with Dr. Mercola, Paul says that people should use whatever they have access to for a garden mulch. It doesn’t have to be wood chips. He suggests that even rocks can make a good garden mulch, and he says that Japanese gardeners mulch with rocks. 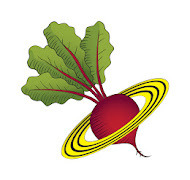 —Back in the 1970s and early 1980s I was an avid reader of Organic Gardening magazine. There were frequent articles on the subject of mulching with rocks. So, as a teenage gardener, I once used a lot of flat rocks to mulch between some rows of onions. Weeds grew up between the rocks, and were hard to remove. A later article in the magazine presented a better rock-mulch idea… instead of a single layer of flat rocks, use a double layer to better shade the soil. I never tried that, but it makes more sense (I might just revisit that idea one of these days). —Paul uses a string line to lay out straight rows in his vegetable garden. He then uses an iron rake to scrape a shallow furrow in his chicken-scratch-compost mulch, and he plants seeds into the soil at the bottom of the furrow. —He spaces his garden rows 36” apart. They are all flat-ground plantings. No raised beds. Paul says that raised beds dry out. 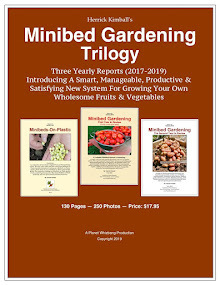 —His 36” row spacings and the plant spacings in his herb garden are much greater than many popular gardening systems suggest (i.e., square-foot gardening). But these plant spacings are, undoubtedly, an integral part of the success of his garden. When plants have lots of root space, they grow better, especially in a low-rainfall climate. This is explained very well by Steve Solomon in his books, Gardening When it Counts (one of my favorite gardening books) and Gardening Without Irrigation. —Paul’s vegetable garden is in full sun. And his region is known for getting a lot of sunlight (little cloud cover). This is always a good thing for a garden! You can go to YouTube and find stories of Back to Eden gardening failures. And, on the other hand, you can find stories of success using wood chips as a heavy garden mulch. If you are an experienced gardener, and you look at some of the YouTube examples of Back To Eden gardening that are presented as a success, you might think to yourself that it doesn't look as successful as your own garden, which isn't mulched with a lot of wood chips. That has been my own observation. The bottom line here is that gardening in a wood-chip-mulched garden does work really well. And gardening in a wood-chip-mulched garden doesn't work really well. The final outcome of the Back to Eden method will depend on a lot of variables. In the next part of this 3-part series, I will compare my Minibeds-on-Plastic gardening idea with the Back to Eden approach. There are similarities and differences. My objective is not to present my idea as superior to Back to Eden gardening. But I do think it presents a more manageable gardening concept, that can be very productive and satisfying for some gardeners in some gardening situations.